After 8 days of intensive training in peace building and conflict transformation, the journey of the 71 Generations For Peace Delegates from 8 countries, comes to a close. In the traditional manner, this Generations For Peace International Camp came to an end via press conference. 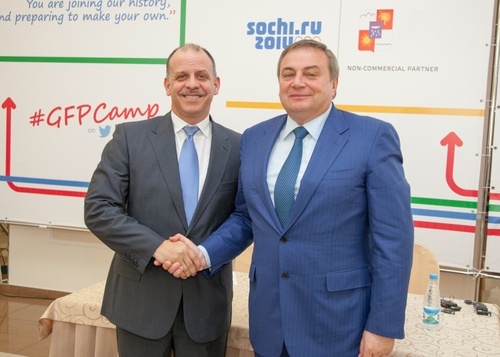 The chief guests at the press conference were founder and chairman of Generations For Peace, His Royal Highness Prince Feisal Al Hussein, Sochi Mayor Anatoly Pakhomov and Sochi 2014 President and chief executive Dmitry Chernyshenko. 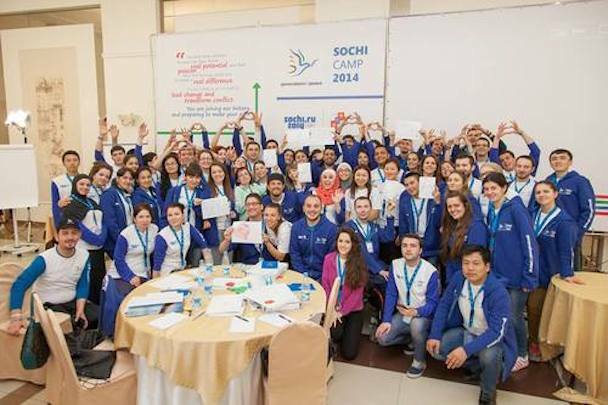 At the event, HRH Prince Feisal Al Hussein congratulated the Delegates on their hard work and great enthusiasm, and encouraged them to take the skills they have gained at Sochi Camp 2014 and implement them in their home communities. He went on to say, “To be successful the work doesn’t stop at the camp, it starts here!” In his speech he recapped the journey taken by the 71 Delegates, mentioning the presentation they received from Russian Paralympian Sergey Shilov and their attendance at the Paralympic Opening Ceremonies, as well as thanked Sochi 2014 and Sochi City Administration for their past five years of support through the “Legacy Today” partnership. The press conference concluded with questions from the media and from several Generations For Peace Delegates. Later that evening, a gala dinner was hosted for the Delegates at which each country group put on a beautiful performance for HRH Prince Feisal Al Hussein and for each other. The manner in which the Delegates cheered for each other and participated in one another’s national performances was inspiring. Their solidarity and mutual respect confirmed that, despite historical circumstance, people can stand together in the name of peace.